BISMARCK, N.D. (AP) — The Pine Ridge Indian Reservation in South Dakota, one of the poorest areas in the nation, is bracing for another major winter storm and the prospect of renewed flooding that is also forecast to hit a wide swath of the Plains and Midwest just a month after the last weather blast. March’s ‘‘bomb cyclone’’ — an unusual weather phenomenon in which air pressure drops rapidly and a storm strengthens explosively — dumped heavy snow on Pine Ridge that led to severe flooding. The high waters trapped hundreds of people in their homes, damaged or destroyed hundreds of miles of roads and dozens of buildings, disrupted water supplies to thousands and prompted the governor to send in the National Guard . The prairie reservation is roughly the size of Delaware and Rhode Island combined and is home to nearly 20,000 people, many of whom live in deteriorating houses or cramped mobile homes. About half live in poverty, and the unemployment rate hovers around 75 percent. The tribe will be seeking help for flooding-related infrastructure repairs from the federal government as well as charities and nonprofits, but many private property owners are looking at the prospect of funding extensive repairs on their own. The storm moving east out of the northern Rockies Wednesday and Thursday could be similar to last month’s. It will pack heavy snow and strong winds and produce life-threatening conditions in parts of the Plains and Upper Midwest, according to the National Weather Service. 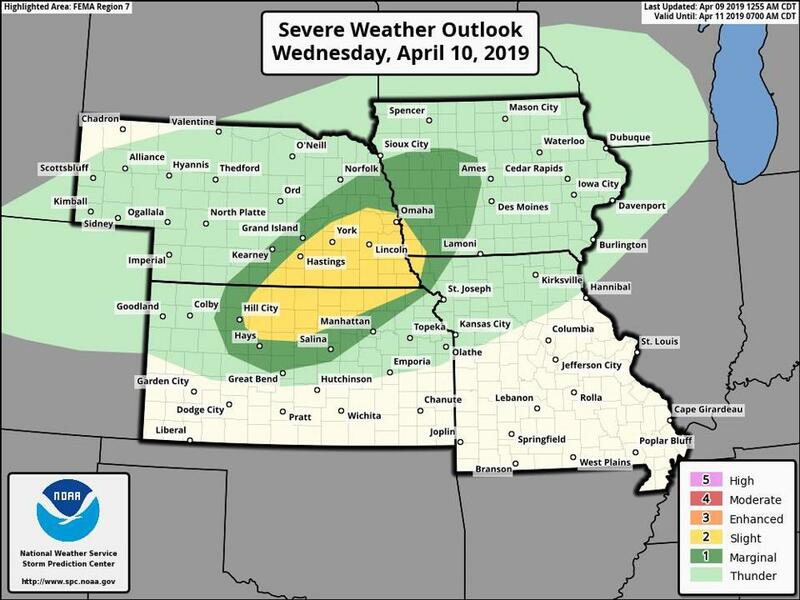 The heaviest-hit areas are expected to be from southeastern Wyoming through Nebraska and South Dakota into southern Minnesota. Snow is forecast to expand into parts of the Upper Great Lakes, with rain stretching from the central Plains east into the Middle Mississippi Valley and Western Ohio Valley. The storm deemed ‘‘potentially historic’’ by the Weather Prediction Center brings the specter of renewed flooding to a part of the country where massive flooding over the past month has caused billions of dollars in damage . Nebraska is not expecting a repeat of the catastrophic flooding it experienced last month because the ground is no longer frozen and ice has melted from the rivers, though there might be localized flooding across the state, according to weather service meteorologist Van DeWald in Omaha. The biggest threat will remain along the already swollen Missouri River, he said. In northwest Missouri’s Holt County, where the raging Missouri River ravaged roads and highways, Emergency Management Director Tom Bullock is urging residents to be prepared to get out if another surge of water arrives after this week’s storm. The storm crept slowly across Idaho and Montana on Tuesday, dumping rain and snow and prompting blizzard warnings for Wednesday and Thursday in parts of Wyoming and Colorado. The storm might not be as bad as last month’s but ‘‘will be near record intensity for April for this area,’’ Colorado State Climatologist Russ Schumacher said. Pine Ridge could see up to 15 inches of snow and winds gusting in excess of 50 mph (80.46 kph). Tribal officials are examining weak spots in the response to the March storm, particularly medical evacuations. Last month, three people who suffered medical problems died before ambulances slowed by floodwaters could get to them..
Henry Red Cloud owns a solar energy business and green energy training center that was heavily damaged by floodwaters against which it was not insured. In the meantime, Red Cloud is hoping the nearby White Clay Creek stays in its banks after this week’s storm. The new snowmelt will swell creeks and rivers in South Dakota, but likely not to the levels they rose last month due to the absence of a wet snowpack on the ground this time around, according to weather service hydrologist Mike Gillispie in Sioux Falls. Rivers in Minnesota and neighboring Wisconsin also are expected to rise again after the storm, and ‘‘The National Guard stands ready,’’ said Minnesota Gov. Tim Walz. The storm is not expected to add a lot of moisture to the Red River Valley of eastern North Dakota and northwestern Minnesota, where major flooding is occurring, according to weather service meteorologist Greg Gust in Grand Forks. It’s not causing big issues in the Fargo-Moorhead metro area, but overland flooding is a problem in many rural areas. Associated Press writers Colleen Slevin in Denver, Jim Salter in St. Louis; Margery Beck in Omaha, Nebraska; Jeff Baenen in Minneapolis; and Steve Karnowski in St. Paul, Minnesota contributed to this story.